Light, fluffy strawberry mini cupcakes are topped with sweet vanilla buttercream in this Strawberries and Cream Mini Cupcakes recipe. It stands at the edge of a park on a quiet street, black shutters and white clapboard waiting to be loved. Inside are the details I’ve only dreamed of having in a house — carved moldings, tin ceilings, sunny window seats, stained glass. It’s big — larger than I thought I’d ever want — but would be the kind of house we could lovingly restore and live in forever. I can practically picture how we’ll transform one room into a library and reading room, complete with comfy chairs, little tables and soft throw rugs. We’ll collect our books in there, in built in bookcases all over the room, and we’ll retreat there to dive into stories. In the spacious dining room with the built-in cabinet, we’ll host dinners — our friends, our family, colleagues, holidays, whatever — and it will be filled with laughter and cheer. And we’ll spread out in the bedrooms, each with our own space decorated just right. And there’s even space for an office suite — complete with a second kitchen that I could use just for work. The house will be alive with energy, excitement and life. But all of that is the dream. The house isn’t without its issues. There’s pipes to worry about and carpets to remove and a kitchen not ready for prime time. And how much would it even cost to heat something that size in a Maine winter? But there’s something about it, something about how it needs a family to love it, that calls to me. And yet, I am torn … the maintenance of a house that large, to take on a restoration project that large, to keep it loved and cared for: it’s all a massive undertaking. Step one: Step out of the pictures and see it in person. Maybe then I’ll have a better sense of whether it’s for us or not. It’s in my budget … sort of. If I had a better savings, a better down payment, a better understanding of what that house needs … maybe this would be easier. There’s a lot of ifs and questions and wonders. So, we’ll see. Have you bought a house? What was the experience like? 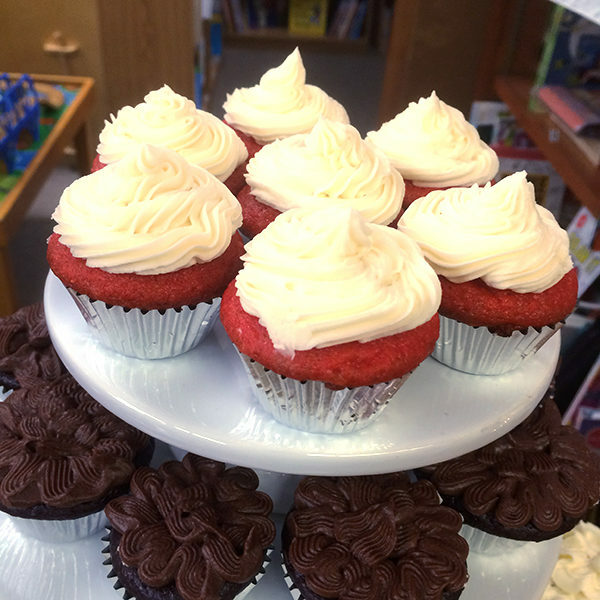 In the meantime, let’s dig into something sweet … like these Strawberries and Cream Mini Cupcakes that I recently made for a local independent bookstore to giveaway on Independent Bookstore Day. They’re light and moist and strawberry-flavored and frosted with a vanilla buttercream. Delightful. To get that lovely color and strawberry flavor, these have strawberry extract in them, which I’m kinda in love with. It adds so much amazing flavor to anything made with it — like those Cut-out Strawberry Sugar Cookies I made for the Royal Tea Party. 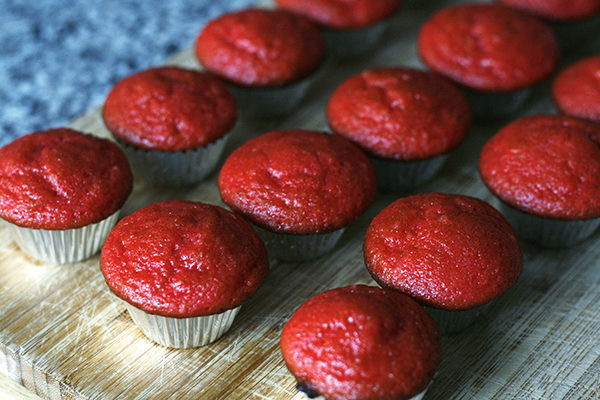 These cupcakes are a transformation of my very favorite recipe for one bowl cupcakes. 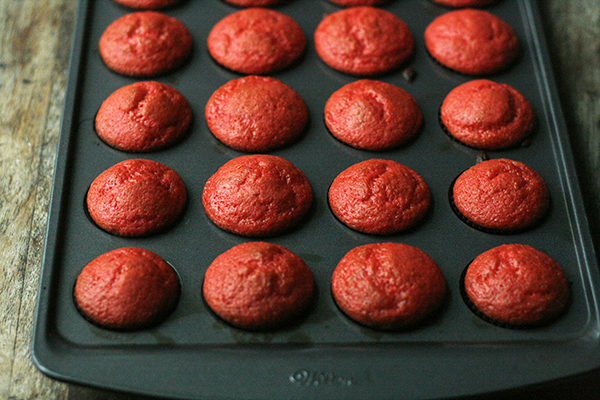 They’re a strawberry delight with no dyes or faux flavors required. And those moist, soft strawberry cupcakes are even better when topped with creamy vanilla buttercream frosting. But that’s no ordinary frosting. Oh no. That frosting is something to write home about — because it has only three ingredients. (Before anyone asks, it’s no mistake that it doesn’t have milk or cream in it. It doesn’t need it.) By whipping the butter first, and then adding the confectioners sugar and vanilla extract, you create a perfect, creamy frosting that pipes perfectly. Preheat the oven to 375 degrees. Line 24 mini muffin cups with liners and set aside. In a medium mixing bowl, sift together the flour, sugar, baking powder and salt. Add the egg, milk, oil and strawberry extract to the bowl. Whisk vigorously for two minutes, until smooth. Once the cupcakes are cooled, make the frosting. In the bowl of a stand mixer fitted with the whisk attachment, beat the butter until light and fluffy. Add the confectioners sugar and vanilla extract. Beat on low to incorporate and then on medium until well-combined and smooth. 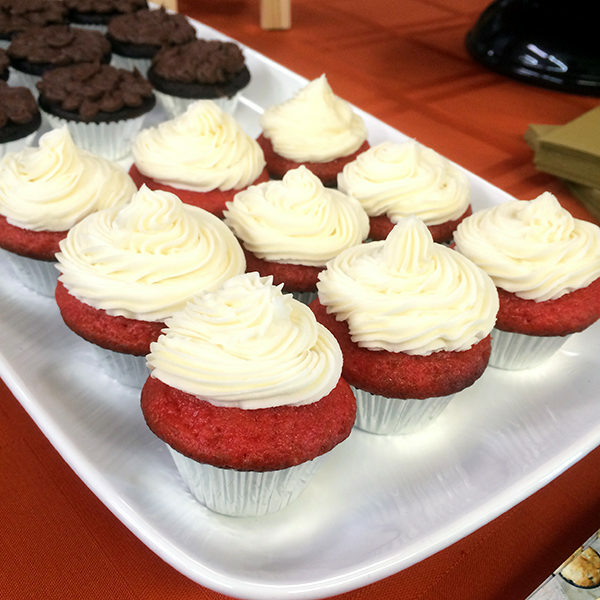 Pipe onto the cupcakes, as desired. Special thanks to The Briar Patch bookstore in downtown Bangor for letting me invade their space with towers of cupcakes. My house buying experience is worlds away from where you are. For me, owning a house is not a big deal, I’m just as happy to rent. But it was THE thing for my husband. The end goal. The only sign of success. And so we bought a house he loves, and I hate. Which is fair in the sense that home for me is the people, not the walls. Even still, I’m anxious for the day we can take the time to find a place we both love. I completely understand where you’re coming from. The house I owned in CT I hated. I resented it. And it was awful living in a place that I just didn’t like. Since then, I’ve rented and been so happy with that. But we need more space and finding space that suits our needs in my budget has proven near impossible. It’s frustrating. So buying seems to be the only way … And our rental has served us well, but I don’t love it either.